Displaced people gather at an IDP camp in Endebess in western Kenya, while MSF sets up tents for them. Thousands of people from the area whose homes have been attacked or burned down continue to seek shelter in this and other IDP camps. Even as a political settlement was reached in Kenya, MSF teams continued to provide medical care in Nairobi, Nyanza, Rift Valley, and Western provinces. Many areas of Kenya remain tense: in Nairobi, MSF has adapted their long-running HIV/AIDS projects to also provide care for victims of violence; in western Kenya, MSF is responding to people’s needs by working in internally displaced persons’ (IDP) camps and supporting health centers and hospitals. Meanwhile, mobile medical teams travel to rural areas every week to provide care to the many hundreds of Kenyans who are trapped there with little or no aid. A young woman whose hand was badly injured when she was attacked with a machete in Kibera slum receives treatment at an MSF clinic. MSF’s projects providing primary health care, HIV/AIDS, and TB care in Kibera and Mathare are running as normal. However, the violence and insecurity of the past few weeks has had an impact on the number of patients attending appointments. In Kibera, where MSF supports four health structures, nearly 20 percent of patients receiving HIV care missed appointments in January. In Mathare, the figure was around 10 percent. There has also been a drop in the number of new patients enrolling in MSF’s treatment programs. In Kibera South Health Center, where MSF would normally enroll around 100 new HIV patients each month, only 60 new patients were enrolled in January. One step MSF has taken to recapture patients is to set up a toll-free telephone hotline, marketed with advertisements, posters, and flyers. 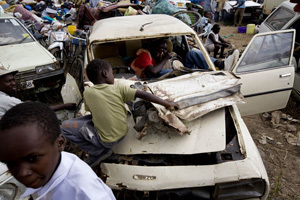 Displaced children of a targeted tribe take refuge in wrecked cars by a police station in Rift Valley. 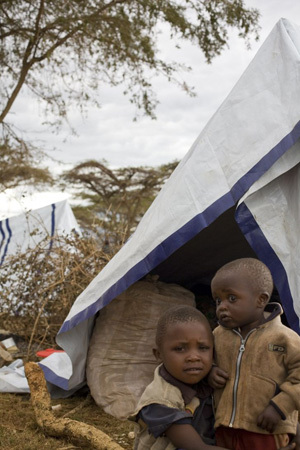 The situation in the Rift Valley, where thousands of people have been displaced, is fluid. Since early January, many people have been living on large sites, such as stadiums and showgrounds. Others have sought protection at police stations, prisons, and churches, or are living in small groups in remote areas. In some areas, people are moving regularly; sites that were once filled with people can be empty just a few days later. So, mobile clinics, where MSF medical teams visit different sites every week, are an essential way of responding to the changing needs. During these mobile clinics, MSF staff provides medical consultations and ensure that clean water and sanitation facilities are available. For example, in Molo district, mobile teams visited 13 sites and provided 5,400 consultations between February 11 and 24. The majority of consultations are for upper respiratory tract infections and diarrhea. When necessary, MSF teams also vaccinate children under five against measles, polio, and tuberculosis, provide them with vitamin A supplements, and assess their nutritional status. In addition to running mobile clinics, a “flying team” made up of a doctor, a nurse, and a logistician are visiting different locations, such as Kisumu, Kisii, and Transmara, in order to evaluate the needs. A long-standing conflict in the Mount Elgon region has left many Ministry of Health facilities unable to operate as normal, and, as a result, many people in this area cannot access health care. MSF mobile teams have been working in the region since April 2007 and are also monitoring the health situation in the neighboring Trans Nzoia district, which has seen an increase in violence in recent weeks. At times, a shortage of staff, combined with an increase of patients, has left the Kenyan Ministry of Health in need of extra assistance, so MSF is also supporting some health centers and hospitals. In late January, when violent clashes left many wounded, surgical teams supported hospitals in Naivasha and Nakuru. Between February 8 and 21, a surgeon, an anesthetist, and a nurse performed 22 operations at Kericho hospital. As only 50 percent of the hospital’s regular staff have returned to work, an MSF medical team will continue to support the hospital in the coming weeks. On February 20, in Timborao, south of Eldoret, MSF started working in a health center near an IDP camp where about 4,000 people are living. MSF will run clinics in the health center every morning, supply the center with drugs, and supervise and train the existing staff. Children sit in front of a tent in the Endebess IDP camp. 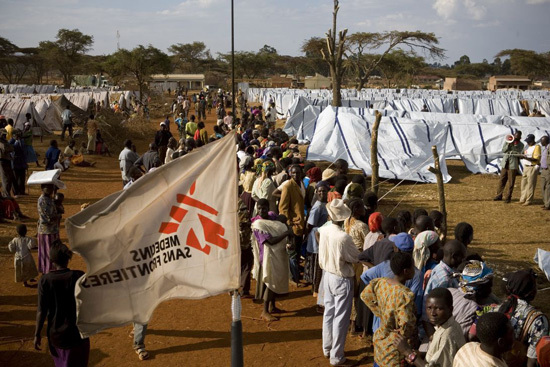 MSF has been working in and around Kitale town since January 7, and teams have helped set up two camps for internally displaced people in Cherangani and Endebess. In Endebess, MSF staff built tents for around 6,500 people. As this shelter was intended to be temporary and the rainy season is approaching, MSF is now focusing on upgrading these tents into more permanent structures. A health post was opened in the camp on February 9 and MSF teams are responsible for health promotion, hygiene and water sanitation—providing showers, latrines, and clean water—as well as mental health counseling and hospital referrals. MSF will continue to monitor the health activities in Cherangani camp and will provide shelter on the Kitale showground. In Nakuru, an MSF medical team continues to provide about 150 consultations every day in the town’s stadium, where about 2,000 people are thought to be living. In Kacheliba, Pokot District, MSF has been treating people infected with visceral Leishmaniasis, also known as Kala Azar, since the end of 2006. Activities in this region have not been affected by the insecurity and violence in other parts of Kenya, and teams continue to treat patients infected with this potentially fatal disease. Long-running HIV/AIDS projects in both Busia and Homa Bay continue as normal.